As Assistant Commissioner for Strategic Planning and Partnerships at the Chicago Public Library, Amy Eshleman oversees all aspects of the library’s YOUmedia project, an innovative, 5,500-square-foot learning space focused on providing a multimedia, multipurpose center for Chicago teens. 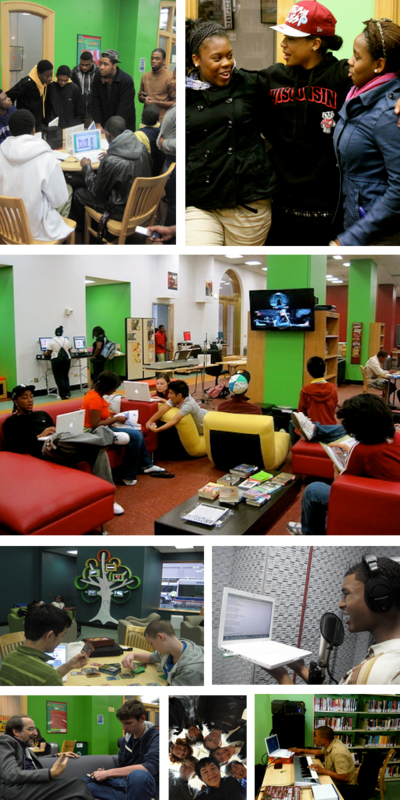 The space allows youth to hangout, explore new media, and develop a greater awareness of the library as a resource. YOUmedia’s design concept stems from extensive research conducted by Mimi Ito’s Digital Youth Project, which found that students thrive in an environment where they are encouraged to not only consume media but create it as well. In the next year, a dozen new 21st century learning labs will be constructed in libraries and museums across the country. 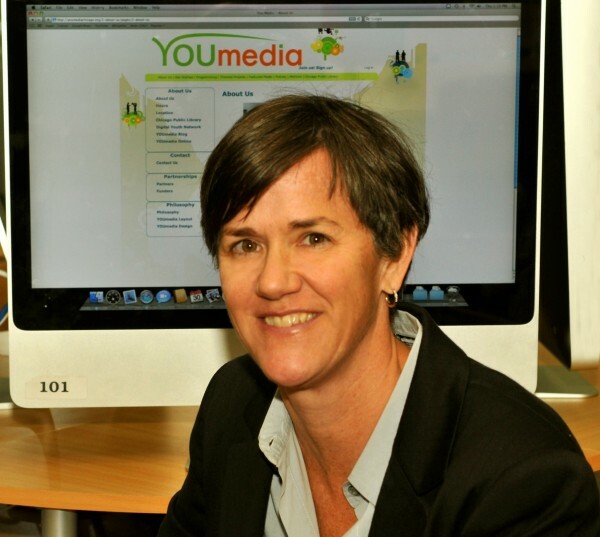 As the YOUmedia project approaches its third anniversary, we sat down with Amy to ask her about how the space has changed over time and what it means to her personally to reinvent learning resources for today’s teens. The YOUmedia project is solely dedicated to empowering youth voice through media creation. What tells you this model is working? In the last two-and-a-half years, we have seen just how much the space means to the youth, to the mentors, and to the library. One boy in particular, named Kaillif, goes to school just south of the library at Jones College Prep High School. He found us just because we were in the neighborhood, and he heard we had gaming. When he came into YOUmedia he knew it was a space unlike any other he had experienced in a library. He was immediately drawn to Rock Band, and for the first three months, it’s all he engaged in. Rock Band may have been the hook to get him into the space, but what makes YOUmedia so magical is the mentors and the adults we have who get to know the youth. They saw that Kaillif had an incredible interest in video games, not only as a consumer of them, but he had a lot to say about them as well. So we slowly encouraged him to participate in creating content around games. He began writing game reviews and learned how to build new levels for games. He started creating a real community around games and contributing to that knowledge space. He was blogging about games but also challenged himself to become a better writer. He was part of a group of gamers that decided they wanted to design and build a prototype game controller, and by working with our mentors, they learned about the principles of design and actually built a prototype. So here’s a kid who came in the door thinking all he was going to do was play Rock Band; now he’s one of our most talented producers of media. He participates in YOUmedia in a way that he doesn’t participate in a classroom. Teachers tell us they are surprised at the level and quality of work and the engagement that youth have in YOUmedia, which they do not have in the classroom. Kaillif is a great example of that. Is it time we start redesigning learning in a way that fits the needs and interests of youth? We have always wanted to adapt to the way youth are using digital media to learn and also to be social. They push us to rethink our strategies. We knew what we had before YOUmedia wasn’t going to fit the needs of our teens. We wanted a space that had a real curriculum. Even little things like having food in the space were so important in the design. It’s their space and they are not shy about talking to us about the resources they want to see. They drive what we do. Just recently we changed the way we designed the geeking out part of YOUmedia — the more formal learning opportunities — to make it fit what the youth were interested in instead of what we thought they were interested in. We offer project-based workshops to provide context for the work, but it’s up to them on how they decide to enter into those projects. The space has become a melting pot. Youth walk through the door with their friends but then they scatter, connecting with those in the space who share their same interests — those who love to do photography, or love to make beats, or who are interested in video editing — that’s what’s been so wonderful to see. It turns to another conversation we were just having about how we balance a kid who’s spending every night in YOUmedia with needing to get his homework done. Clearly he wants to learn in the way he is learning in YOUmedia. I think it is up to us to work with our schools so we can think of new ways to illustrate achievement and skills. Working on things such as a badge system could help make that connection back to the classroom. How does the YOUmedia project allow for collaboration and passion-driven learning while upholding the library’s primary mission to serve as an educational resource for youth? Public libraries are all about life-long learning. YOUmedia has pushed the Chicago Public Library and libraries across the country to make that shift as places where information is not only consumed but also where there are supportive resources and programs, which allow for learning by creation, making, and doing. The research shows that’s the way youth are learning. Teens in the space have really embraced our city-wide reading initiative, One Book One Chicago. It shows how traditional media can serve as a jumping off point for new kinds of participation and production. Before we had YOUmedia, kids would just read the book and at most have discussions. Now teens from all over come together and read the book, and we offer a variety of activities and workshops to get youth to enter into the book in a w ay that is of interest to them. While reading Toni Morrison’s book, A Mercy, we had the designers redesign the book jacket; we had the musicians make beats and spoken word artists put a piece behind that music; and we had photographers reimagine scenes in the book that were meaningful to them. We took this model and made a curriculum around it. Kids talk about how they worked collaboratively to create really beautiful pieces of art around the themes in the book. It’s very powerful. We are constantly challenging ourselves from a design perspective about how we can clearly support youth and their interests, but we are also keeping in mind what it means in the long term. Speaking of long term, what key elements need to be taken into account when designing the next installment of 21st century learning labs? This is something we have talked a lot about — the key concepts and overall goals of YOUmedia. It is so important to have well trained adults in the space who have cultural capital with the youth and also have a body of work, which can serve as a model for them. We look for working artists or librarians who are not only wonderful experts in teen literature but are also gamers and film studies majors etc. We are really fortunate to have the Digital Youth Network as a key partner. The space has to support a variety of activities and link back to the mission of the institution. We don’t want it existing in a bubble. We want it to be part and parcel of life in the institution and also help position that institution into a new way of thinking about high school learning in that particular city. The space must support not only learning but real skill development in the context of mentoring and peer relationships. You then have to figure out how to come together as a team — as a whole professional development model — to best support youth’s learning and skill development. I speak from the library perspective and the museum world when I say we know we are not meeting the needs of our youth. It’s about taking the best of our missions and what we have to offer and rethinking them in a way that is much more relevant for youth. Some of this is going to work and some of this is probably not going to work. But what I really like about these new learning labs is that they put research into practice. It takes the hanging out, messing around, and geeking out concepts and remixes them in new ways. It will challenge us all. We are excited to create a community of best practices that we can share. It will raise the level of our work. We still have more to accomplish. We can serve as a model for these new sites to get up and running so that, in time, we can all learn from each other. Was the public library a big part of your life growing up? We had nothing like this when I was younger. We had a Carnegie library in our very small local town so I have very fond memories as a kid of being immersed in books and growing up in that culture. I was very fortunate that my parents pushed reading. I always felt that I wanted to be in public service, and this project has been so incredibly wonderful for me because it marries for me both my love for learning and books and my real interest in public service and how we, as a city, can support the people who live here by creating opportunities for youth that will pay off in the long run for everyone. We have a youth named Malcolm who did a piece on his time spent with YOUmedia, and it crystalizes it for everybody. It really shows how powerful the space can be, and whenever I am questioning what it is we are doing, I go back and play that piece.